Life has been getting busy. Again. Mostly this is because I work in a theatre and we’re having the annual Christmas silly session but also because I’m supposed to be writing a report/dissertation for my final year. However, we are making some progress, and interesting things have been arriving at the Ingermany household. 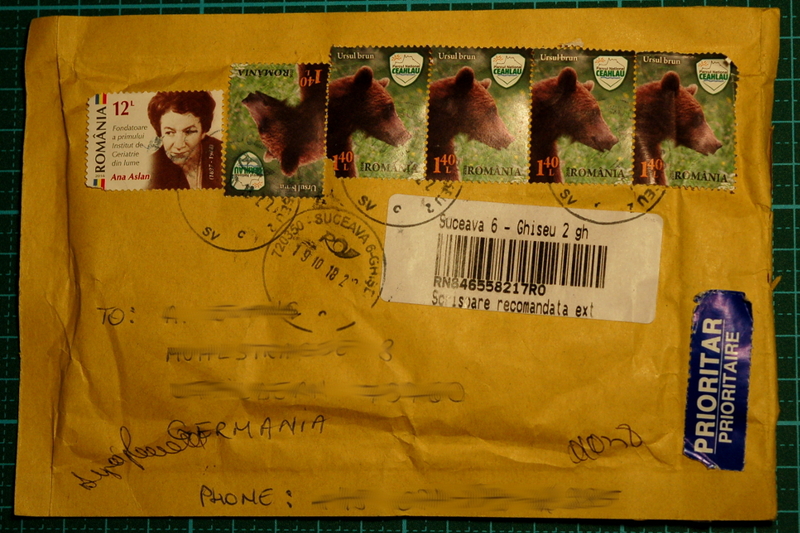 The first is this package from Romania, which is apparently the only place in Europe where you can get old school braze-ons for traditional gear levers. This is the result of far too much thinking and a lot of online questioning after discovering the normal solution for fixing gear levers to the bottom bar -a collar clamp- wouldn’t be possible because the bar is about 1mm too thick. You don’t have to braze bits on the bike. You can drill a hole through the frame and bolt the gear levers onto that, but I’m a bit jumpy about messing about with the integrity of the frame. Having finally found how to fix levers onto the bike, we ordered a set of levers from Elder Son’s employer, who themselves ordered them from the Shimano EU distributor, who it turns out are five minutes down the road. To my rather great surprise these fit the braze ons perfectly. Now I have to work out how to get the frame and Braze-ons down to work for our resident metalworker to fit them together.